"Ai, que sandálias tão giras!! "; "Não acredito, têm outra vez as calças iguais às minhas verdes!! "; "adoro blazers oversized!!". E quando vou a ver tudo o que tinha na mão era cor-de-rosa! E por uma questão de prática (uma peça era uma parte de cima, outra uma parte de baixo e outra uns sapatos) acabei por experimentar tudo ao mesmo tempo. E não é que adorei?? Ps: Não, não há nenhuma parceria por trás deste post. A Stradivarius não patrocinou nadinha, a marota! "Oh, look at these cute sandals! "; "I can't believe that they have again these pants that I have in khaki!! "; "I love oversized blazers!!". And when I stopped and took a look at what I had on my hands, everything was pink! And to be more pratical (one item was a top, another one was a bottom and the other was a pair of shoes) I tried it on all at the same time. And guess what? I loved it! Ps: No, there's not a partnership behind this post. Stradivarius didn't sponsor anything, that bad girl! You look stunning.love the whole pairing. Pink is my favourite color and I want your shoes now!!!!! Acho que este é o meu outfit preferido de sempre no MKJ! A sério que adoro mais do que tudo Bárbara. Construiste um look que consegue ser fofinho (cor-de-rosa é sempre) e polido ao mesmo tempo. This is a stellar and sophisticated suit, love this pastel pink hue, you look so elegant. Have a wonderful start to the weekend! well good start of vacantion! i love pink :3 you look so pretty! Pink Pink Pink ♡ C.
I adore this look sweety! Your style really inspire me! You are one of my favourite bloggers! Really! ...someone said it is a happy colour...that may be it...it does bring to mind nice thing, doesn't it? I think this outfit would be great even if it weren't pink..but being pink makes it extra fabulous:) I do love this pastel pink blazer! and pants! and sandals!!!! so well matched, so well put together, very stylish!!! Que guapa, me encanta el color rosa y el toque del bolso queda perffecto!! Pretty in pastel pink! Great leopard bag too! Que look lindo!!!! Já te tinha dito, adoro esse blazer. O look resulta muito bem. Quando vi a primeira imagem, suspirei pelas sandálias, tão lindaaaaaas! great look and fab shoes! 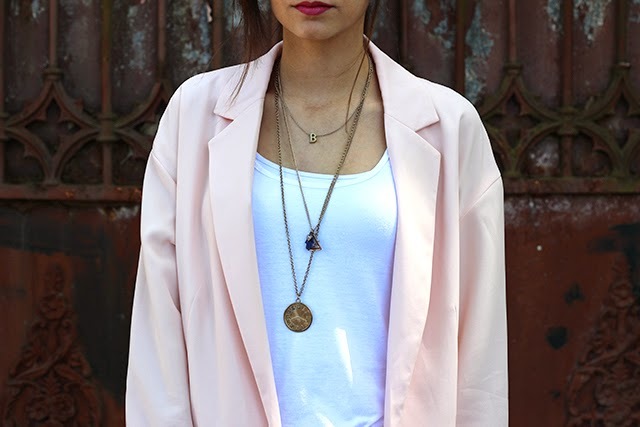 I totally dig that pink over sized blazer, it goes so well with a simple white tee and some cool necklaces! Enjoy your holidays girlfriend, you totally deserve them :)! And post some pic over on IG so we can drool a little :D! lovely color! i love the shoes! Adorei, adoro rosa e esta combinação ficou uma máximo! I lOve oversize blazers too and this shade of pink is very pretty and cool. Mais que linda!!! Adorei... fiquei encantada! Esse rosa é lindo, super suave e o look está muito feminino! Adorei o look quase total pink, ficou adorável! me encanta el color ! y que fotos tan bonitas ! Esse look é muito lindo, adorei. Love the look, the pictures and the door!! So amazing! You look stunning in pink!!! de espera mais foi tudo resolvido obrigada, tenha uma semana vitoriosa. Pink is not a bad color to gravitate towards - I myself have done a similar thing at Forever 21 but it was all navy blue haha. Love this monochrome look - the particular shade of pink is so flattering and pretty on you!! And those sunnies are fabulous! E ficou um resultado lindo, adorei. me encanta el blazer!! en top shop estaba supppper parecido!! guapa! Love your baby pink outfit! love the soft colors, the whole outfit and just how beautiful/edgy/comfy it looks!